It's one of my favorite fishes (fish? fishes?, sounds wrong). It is only in season and available in the spring here in NJ/NYC, sort of like soft shell crabs and wild salmon. My fish market only gets thin halibut fillets in the spring that look like flounder, and I always take a pass. 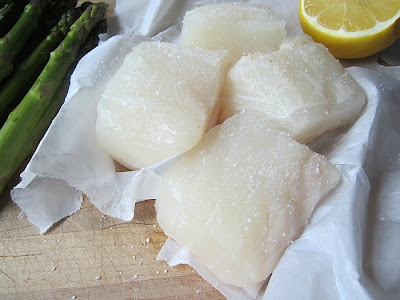 I want the meaty, thick, beautiful big white pieces of halibut, which I only seem to get in a restaurant. (also, we rarely get grouper here, and not sure why, cause it's only coming from Florida). Well, the fish monger at the farmer's market had a beautiful whole halibut, ready to be cut just for me. It was so fresh the fish guy said he ate it raw, sliced for breakfast with some lemon juice, like ceviche. I bit the bullet and bought a 1 lb. piece. I couldn't wait to get that beautiful piece of fish home. 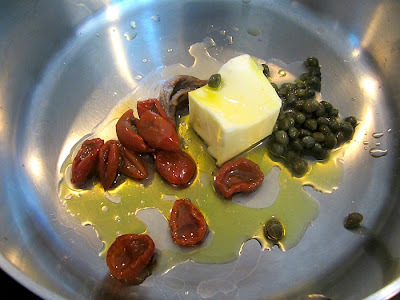 I made a lemon butter caper sauce with some anchovies & semi dried cherry tomatoes. Grilled some spring asparagus and layed the fish on top, pouring the sauce over everything. It was a thing of beauty. Worth every penny (in this case, dollars). My grill pan has a glass lid, which is nice when cooking fish because it doesn't mess up my stove, and keeps the fish moist while grilling, almost steaming it too. Season the fish (I cut mine into 4 pieces for even grilling) with kosher salt & pepper. 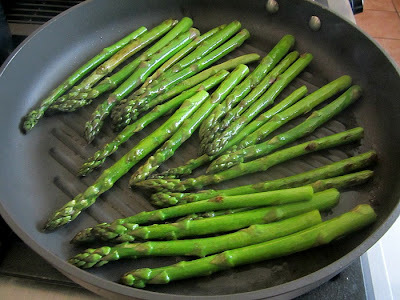 Heat a non-stick heavy grill pan and cook the asparagus (I used the lid for quicker cooking) for about 8 minutes, until cooked. You can also use an outdoor grill or roast them in the oven at 400F for 20 minutes. Remove the cooked asparagus to a platter. In the same grill pan, cook the fish on high (skin side down) for 4 minutes (for a 2" thick piece of fish). Carefully flip over with a flexible fish spatula and cook another 2-3 minutes. You don't want to overcook this beautiful fish. In a small saucepan, heat the butter, anchovies, lemon juice, capers and tomatoes and drizzle with a tablespoon of olive oil so the butter doesn't burn. Cook until the butter and anchovies are melted on low heat, about 4 minutes. 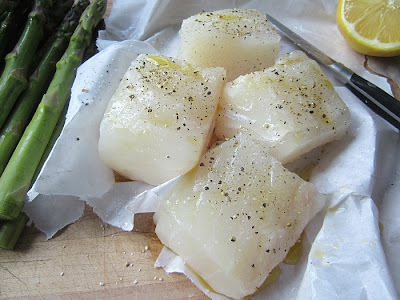 Lay the fish on top of the asparagus and spoon the hot butter sauce over everything. Somethings are just best eaten in the spring. I once caught a halibut of my very own. In the bay off Point Loma in San Diego, about cocktail time. You just drop a line with bait and a sinker on it, very much like the Asians fish. Mine was 12 lbs. We cleaned and cooked it on the boat within minutes. I have never had anything so delicious. Will have to do as you did. Find some really fresh halibut in thickish pieces and ignore the $$$$. Heavenly Hunk o'Heaven. Halibut or Henry? Your pick! All fooling aside, this dish looks sublime. I hate when I see soft shell crabs on a menu in December, you know they are not fresh and in season! 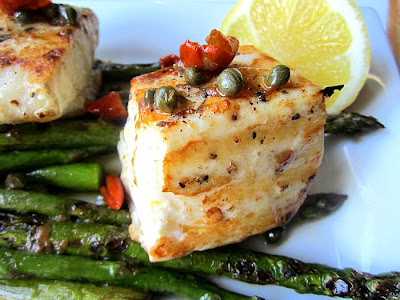 Same goes for halibut! This looks beautiful! My market hasn't had halibut yet this spring, so I'm envious that you found such a gorgeous fish! That sauce is a pefect accompaniment! Yum! Those thick fillets look fabulous! What a great spring dish. I haven't seen halibut yet, but will definitely keep my eye out for it. 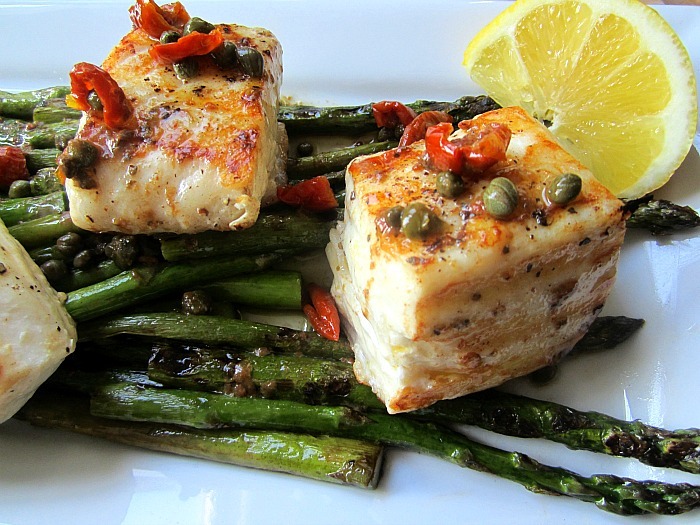 Your pictures look like the halibut melts in your mouth - can't wait to try it! I love that your chunk of butter is as big as your chunks of fish....NICE!